What is the greatest opportunity available to me, as a human being having a spiritual experience? This question has been filtering through my heart over the past week or so. So, let me share with you. Is it the opportunity to discover our own truth? The Truth? Is there such a thing as a personal truth that is separate or distinct from a higher, universal Truth? Is it the opportunity to develop a practice that elevates us to a higher state of Awareness? What may this state look and feel like to us? How may we discern if we are moving towards it or away from it? Is it the opportunity to achieve, discover or uncover our (original) state of (semi) permanent peace, joy and bliss? We have all had transitional forays into such a state, haven’t we? There are possibily more “greater” opportunities (other than the three listed above) that you can think of. I have to admit that the answer to my original question unfolded for me in the form of the three. The opportunity for Truth, also known as Sat. The opportunity for Awareness, also known as Chitta. The opportunity for Bliss, also known as Ananda. Sat, Chitta and Ananda. The three opportunities can merge into One. On the path of truth, our awareness raises us towards bliss. We can avail this greatest opportunity through our discerning actions – to become, or rather (re)discover our state of Oneness – also known as Satchittananda. What is the greatest opportunity available to you, as a human being having a spiritual experience? P.S. We invite you to join us to discuss ‘Spirit and Opportunity’ – Sunday, February 2nd 2018 at 9amET/2pmUTC on twitter. Namaste, and thank you! And no, the fact that two of the most successful rovers launched to explore the surface of Mars were called Spirit and Opportunity. Go figure! An artist’s concept portrays a NASA Mars Exploration Rover on the surface of Mars. Rovers Opportunity and Spirit were launched a few weeks apart in 2003 and landed in January 2004 at two sites on Mars. Each rover was built with the mobility and toolkit to function as a robotic geologist. We are often faced with the advice of “letting go” of certain things in our lives, so that we may be able to “lighten the load” and move forward on our path, whatever that may be at the moment. I have often, repeatedly, given this self-suggestion to myself – “let go of that which is weighing you down”. However, as all of you well know through direct experience, it is much easier said than done. Why is the process of “letting go”, even of that which does not serve us well any more, and worse yet, may be actively or passively causing us and those around us much pain, distress, and even outright harm – so difficult to act upon? One possibility is that we cannot seem to bring ourselves to what we believe to be correct action, is that our power of discernment has been weakened. What is discernment? One simple definition is, the ability to judge well. How do we regain, strengthen this ability to discern well so that we may act well? According to the Bhagavad Gita, our power of discernment is connected to Yoga. Yoga is deemed to be philosophy in action. Yoga comes from clarity and our power of discernment. Discernment is that which leads to a completely volitional and dynamic, action based participation in our life! There seems to be little doubt of the influence that discernment can wield in our lives. So, how do we we regain it? The first step to regain discernment is to be willing to first acknowledge that we may have lost it in certain areas of our lives. Then, we can look at our actions and habits, and separate the ones that meet the ‘dynamic participation’ criteria from the ones that don’t. Next, we decide to give more fuel, more energy to those actions that elevate us from within. After regular practice, we may find that our dynamic, volitional, life-elevating actions, a habitable home in our heart. With positive feedback from our heart, our discernment shall grow. We may then find ourselves becoming aware of “holding on” with discernment rather than focusing on “letting go”. We find ourselves “holding on” to actions fueled by joy, love, light, delight, lightness, lightedness, delightnedness and more. Discernment empowers us to put philosophy in action. We beome practitioners of Yoga! P.S. We invite you to join us to discuss ‘The Power of Spiritual Discernment’ – Sunday, January 28th 2018 at 9amET/2pmUTC on twitter. Namaste, and thank you! -Kumud. The bee hovers, uses discernment to be a dynamic action based participant in life! In the first post of 2018, I had talked about the XYZ of spiritual actions. During the weekly Sunday conversation, the question asked by some of the community members was – “in some way, aren’t all actions spiritual in nature?”. Some posed the question a different way – “are there any actions that are not of a spiritual nature?”. These beautiful questions led me to consider the ideas of service and duty, as related to our actions. I went back to re-read some portions of my dog-eared “Karma Yoga” book that contains several essays by Swami Vivekananda, describing “The Yoga of Action”. Some of the essays therein are titled “Each is great in his own place”, “The Secret of Work”, “What is Duty”, and more. You get the idea – it is my go-to companion when I have a question about “action” that needs some clarity. And so it is that a sense of duty can subtly transform into a sense of service. Heaviness (duty) transforms into lightness (service) when viewed through the lens of selflessness. A sense of service elevates us from a lower plane (of existence) to a higher plane, where the Self can shine through. How do we transform, rise? It is by doing the duty next to us, in whatever role that we find ourselves. We gain strength by doing so. And we go from strength to strength, to higher states, by doing our actions with as much love, joy and selflessness as we can imbue into them. Our attitude of service (before self), even as we keep doing whatever happens to be our duty, can thus becomes the secret of work. What are your thoughts on duty and service? What has been your experience with the two? Are they different or are they the same for you? When we develop an attitude of service (towards others), do we really help them or do we actually help our own selves? P.S. We continue our ‘action-based’ theme for this New Year of 2018 with a conversation about ‘Duty and Service’ – Sunday, January 14th 2018 at 9amET/2pmUTC on twitter. Please join us! If you have ideas, questions or suggestions for the #SpiritChat community in 2018, please share in the comments. Namaste, and thank you! -Kumud. It is often at the beginning of every new (calendar) year, or any new significant ‘life event’, that we pause to consider and evaluate the changes that we may want to make in our life. It is the ‘crossroads’ that often provide us the openness to make (different) choices than the ones that we have been making on our journey(s) that have brought us this far. If we feel empowered enough and free enough to allow ourselves to make different choices, we can then take the next step. This next step often involves ‘taking new action(s)’ to bring our new choices to life in our daily lives. If we do not act differently, our choices remain ‘frozen’ in our heart and mind in the shape of intentions. It is our new daily actions that breathe heat into our heart, and thaw out the intentions so that their results may flow within the world – ours and those that we are connected with. But where are we, who are often ‘stuck’ in our habits, dogmas, myths, and sometimes even our beliefs, to find the energy, the reasons and the support to take new actions? Let us start at the ‘end result’ in my mind. Let me suggest that we go to the end of the alphabet, and consider the ‘XYZ’ of thawing our intentions through actions. First, the X. We may think of this as the “X-factor”, or the ‘great unknown’. On my recent trip to Mexico, I was ‘accidentally’ introduced to a Mayan healer who talked about the concept of “Xi”. Yes, it is similar to the eastern concept of “Chi”. Xi is the dynamic life-force that flows within all of us. The Mayans believe that Xi comes to us ‘at birth’, through the one who births us. When we are in a ‘lower state’ of vibration – weighed down by anger, hate, revenge, and so on – our Xi suffers. We are drained of Xi. The good news is that we can re-energize ourselves by putting ourselves into a ‘higher state’ of vibration through the practice of awareness (of breath) an mindfulness (of the moment). What is the state of our Xi, the X-factor in our life? Second, the Y. I think of this as the “why”. You may have heard the quote – “when the why is big enough, the facts don’t count”. I am sure that there has been at least one instance in your life where your reason, your why, was so strong, that you ignored all of the “so called’ facts. You took action anyway. I am not talking about ‘impulsive’, ‘spur of the moment’ actions that we often take. The bigger “why” is something that has been nudging us, speaking to us in our heart for so long that we can no longer ignore it. When we find ours, it becomes fuel for action that raises our Xi, and empowers those around us to raise their Xi too. Yes. That Y. Do you know your ‘Y’? Third, the Z. We are often advised to ‘begin with the end in mind’. So, that becomes our Z. It is not exactly an ‘end’, but a milepost that we may create for ourselves. The milepost can inform us about how far we have come as a result of making new choices, taking new actions. The ‘Z’ can beckon to us to keep moving, to take that next step, while also being mindful and present about how and where we arrive with every step. Sometimes, we may ‘lose’ some loved ones along the path, and their loss may deplete our Xi, make us question our Why, cause us to reset and revise our milepost, our Z. We are reminded of the circle of life. Life has a way of reminding us of the XYZ – the consequences of our choices, our actions. Life also has a way of renewing us. We begin anew. We arise, awaken to our reservoir of love. We relearn how to put joy in every step, in every action and celebrate every arrival along the way. Step by step, we raise our Xi, we rediscover our why, and we create new mileposts through our new choices and actions. Happy New Year, and Namaste! P.S. We ring in the New Year of 2018 with ‘The XYZ of Spiritual Actions’ – Sunday, January 7th 2018 at 9amET/2pmUTC on twitter. Please join us! If you have ideas or suggestions for the #SpiritChat community in 2018, please share in the comments. Namaste, and thank you! -Kumud. How Does Change Make Communities Thrive? Change is always changing. A circular statement? Although it is, change is never static. The impact of change on individuals, families, colleagues, and citizens is unsettling and welcome. We begin to see the dichotomy of change. Some change we like, and other changes we do not. Change can wear on us or enliven us. More than either of these options, we may end up talking more about change than changing. Talking is easy. Change takes action. A famous Mahatma Gandhi quote is “Be the change that you wish to see in the world.” The words are inspiring. “Be the change” has evolved into an almost static moment. Just be, and all will be fine! “Be the change” is much more. I believe it means that we need to act on the change we wish to see. We need to be the example we want to see. What if one person gathered 20 others to facilitate change? What if one person helped 20 people? What if each of the 20 individuals engaged in change or being helped by another then did the same? The power of change multiplies when we join with others and then they do the same. Picture this. Twenty people standing in a circle holding hands. On top of each grasped hand, another hand connected with another 20 individuals connected in a circle. And then again and again. What you visualize is the concentric power of 20 people facilitating change. Margaret Mead, a cultural anthropologist, said, “Never doubt that a small group of thoughtful, committed citizens can change the world; indeed, it’s the only thing that ever has.” Twenty people is a small group. Twenty people, energized by one, can energize a community. We can be the change, or we can rise to another level. We can act on the change we want to see. Being present is a starting point. From here, we need to act with the passion of change and the compassion of understanding the change required to make a positive impact. A positive impact is a community growing, serving, and making lives better. Enabling a thriving community is not complicated; it is hard. We can never let the challenges hold us back. Instead, we need to rise up to the challenge for the sake of our communities and character. Join us for a #SpiritChat conversation about change and community. As part of this conversation, consider starting a small project of change within your community on January 20th. A grassroots initiative started called #One20. The goal: On Inauguration Day, let’s make it a day of doing good works. Let’s show our better side by doing good where we are. Let us act on the change we what to see and experience. Learn more at One20.today and on the One20Today Facebook page. Jon Mertz is the author of Activate Leadership: Aspen Truths to Empower Millennial Leaders and founder of Thin Difference, a cross-generational community to connect leaders on purpose. You can join the conversation on Facebook by liking the Thin Difference page. Ajmanik’s Note: I am so very excited to host my long-time friend Jon Mertz in our weekly #SpiritChat twitter chat on Sunday, January 15th at 9am ET/2pm UTC. Jon’s theme of a ‘call to action’ to create change is a perfect example of “Karma Yoga” – the practice of Yoga through ‘Karma’ or action. Do join me (@AjmaniK) and Jon (@ThinDifference) this Sunday! The experts tell us that there is a short window of time to tap into the ‘extra resolve’ that a New Year brings with it – this window of time is about three weeks. Most ‘resolutions’ are abandoned at that mark in the calendar. So, how do we better the odds of increasing the stickability of our goals and plans past this three week mark? One answer is to make sure that we take more than action – we take loving actions towards our plans. A loving action holds no judgement because it asks the question – am I operating from a place of respect, a place of love – or am I operating from a place of disrespect, of lack of love? In short, loving actions are simply a manifestation of love in action. When we manifest our new dreams, our new goals, our new plans, our new actions, in the framework of love, we learn to love our own self. It is from that place of ‘love in action’ that we will begin a journey on which we are committed to love. It is the commitment to love that will begin to free us of many of our self-imposed expectations. And it is in that new-found freedom, that we can live all of the moments of today. A today in which we take loving action aligned with our new dream, and put love into action. So, an intent to take loving action may be necessary, if not sufficient, to keep us uniformly excited about our new dreams on all the days of the year. All three hundred and sixty six of them. For, with every loving action, which is free of judgement, devoid of conflict, full of expansiveness, we are making a new commitment to believing in love. P.S. What are some other characteristics of ‘loving action’? How can we continue to take ‘loving action’ in the face of the outright hostility of others to our dream? How can we support the dreams of others with our ‘loving action’? For more on these, and some other questions, join us in our weekly twitter chat – Sunday, January 3rd 2016 on twitter, in #SpiritChat. Thank you! 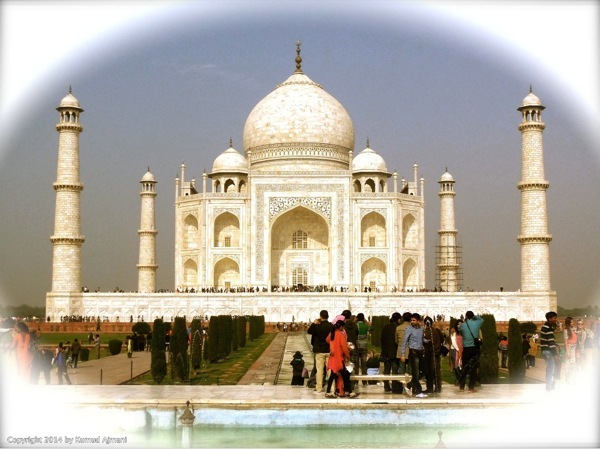 I have been traveling for the past three weeks – to and from India, and extensively within India. It was a trip that turned into a long-in-the-coming family reunion, visits with old friends, making of new friends, and discovering some new places, thoughts and ideas. It was also a trip which helped me to see some ‘familiar’ places with new eyes, tear down some long-held misconceptions, and renew some of my beliefs and values. For that is what travel does for us. It heightens our awareness of our surroundings. It may also brings us face to face with situations which implore us to make mental and emotional decisions in a heightened sense of inner awareness. And when travel places us in environments where the energy of love runs excitedly towards us like a river approaching the ocean, it raises the level of our spiritual energy. Our actions flow from an integrated, heightened awareness. Awareness is the state or ability to perceive, to feel, or to be conscious of events, objects, thoughts, emotions, or sensory patterns. The above definition of awareness holds a lot of promise and potential, for it invokes the actions of perception, of feeling, and of simply being conscious. The objects of these actions are varied, and include events, thoughts, emotions and more. Hence, if we permute the actions with their objects, our interactions with awareness holds forth a lot of possibilities! So, what are the challenges that our everyday life presents to us, that may block our interactions with awareness, prevent us from performing awareness based actions? We often hear or read about the related term, self-awareness, and are encouraged to raise our levels of the same. We may even be intuitively or experientially aware, that the seeds of actions planted by us in self-awareness, produce the best fruit. Despite this better knowledge, we often find ourselves reacting to the push and pull of emotions, don’t we? The new calendar year tends to propel many of us with renewed energy to achieve our goals and dreams. It fuels us with the determination to act on our well-made plans, and our daily action steps. Let us take a few moments to pause and reflect. Are we deeply aware of the actions that we are about to take and the results to follow? How will these actions affect our own inner health? The health of our near and dear partners? The health of those who will feel the ripple-effects of our actions over the course of time? P.S. I invite you to join me as I resume hosting duties on Jan 4th 2015 at 9am ET in our weekly twitter chat. The topic will be – Awareness and Action. Namaste, and have a wonderful 2015!